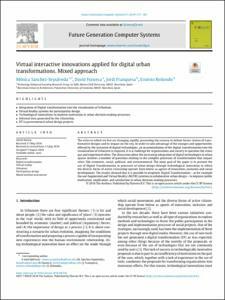 Sánchez , M., Fonseca, D., Franquesa, J., Redondo, E. Virtual interactive innovations applied for digital urban transformations : mixed approach. "Future Generation Computer Systems", 1 Febrer 2019, vol. 91, p. 371-381.